There is something very special in a diamond precious stone. It is the fact that its beauty seems to shine fron within. From all precious materials used in the art of high-jewellry, Diamonds are probably king. Some companies became masters in the way they work with Diamonds. One of the best is Baunat. When Stefaan Mouradian and Steven Boelen decided to create Baunat, there was one strong idea that united them: the love for beautiful diamonds worked and treated at the state of art. The company is Belgium with the headquarters in Antwerp, city of style. Their aim is to buy the best possible diamonds in the world, directly from producers, in order to control all the steps from a raw stone to a precious beautiful faceted piece. Baunat believes that in every single diamond there is an inner beauty to be revealed and only people with passion and love for jewelry will be able to reveal it to the world. One of the strongest ideas within the Belgium company is also the fact that you should pay a fair price for what you buy. Only by giving the right value to things that you truly value them. In other words, the right price for the right diamond is already a form of respect for what nature delivered as a true wonder. By loyally working for many years with professional diamond producers around the world, Baunat succeeds to guarantee quality, purity and stocks. Another important is the origin of the stones. Nobody wishes to buy what we call a “blood diamond”. These diamonds come from areas under civil war in which people died to get you that precious gem. Most of the time, the blood diamonds were used to buy weapons or any other tactical material. Sierra Leona, Angola or Ivory Coast… There are several areas in the world in which blood diamonds can be found. Today there are international laws that try to maintain a certain honesty and to limite the war diamonds. The Kimberley certification, signed in Antwerp, prevents raw blood diamonds to be used by honest businesses. 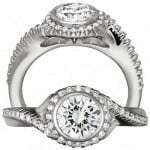 Most of important diamonds dealers use this certification in order to avoid any problem. Nevertheless, this law only applies to raw stones. Once the Diamond is faceted, it is almost impossible to identify the source. That is why when Baunat explains how they master the entire chain of production and manufacturing, these should sound like music to your ears. Only true professionals would invest so much in order to provide you the best and the safest. Another interesting fact with Baunat is they are definitely the jeweller pioneer to sell online. Normally, high quality jewelry is a hidden activity inside the private saloons of Place Vendôme in Paris, the city in London or Fifth avenue in New York. So if you do not have the privilege to visit those places or being part of a private network, you might probably miss the opportunity of buying an amazing diamond. Baunat philosophy spreads the marvelous beauty of nature to everyone. By distributing high qualitative diamonds online, Baunat innovates in terms of distribution and service. Several collections are present, from diamond and engagement rings to neckless or bracelets. In order to help you find what you are looking for, Baunat has put in place a clever tool selector that allows you to browse from several beautiful pieces. Several filters are available, from price range to caratage, Alloy or even Diamond shape. Very intelligent and useful. Baunat has also a taylor made service that will satisfy all your dreams. They will place their best know-how at your service. Another important detail, Baunat has created a dedicated mobile App just for you. This is what they say about the app, available for IOS and Android. Find the perfect ring (size) online via innovative App BAUNAT (www.baunat.com) launched their newest tool, an innovative application for Android- and iPhone users. While it assists the user in selecting the perfect ring, the uniqueness of this app lies in the fact that it allows users to measure their exact ring size thanks to the latest technologies. Furthermore, it’s also possible to create a realistic image of all rings, worn on the app’s user’s finger. The launch of this innovative app strengthens BAUNAT’s position as the trendsetting jewellery brand. The app can be downloaded in the App store and Google Play Store (Android)and is free of any cost. The app is available in English and Chinese. When know-how, passion, dedication and innovation meet, only one result can be achieved: the unveil of inner-beauty. Info sourced at Baunat official website. All content is copyrighted with no reproduction rights available. Waskoll Paris, a strong tradition of excellence at work.